How could a god set the constants of the universe; dream on! A Physics Professor, University of Hawaii, develops and makes available over the Internet a computer program which reveals the results of changes in the key constants in physics. A wide range of numbers would suffice to produce a universe where life could develop. Thus there is no need for a god to set the constants of physics so as to make conditions suitable for life in to develop; it could develop in any of a number of possible universes!!! Recent developments in modern cosmology have bee seized upon to provide scientific support for the notion o intelligent design to the universe. The latest version of the argument from design is constructed around the so-called anthropic coincidences (Carter, 1974, 1983; Barrow and Tipler, 1986; Davies, 1982; Gribbin and Rees, 1989). Here the claim is made that the values of fundamental constants of nature are incredibly fine-tuned for the production of lifeperhaps even human life. This fine tuning is said to be far too unlikely to have been accidental and that the only reasonable conclusion is intelligent design, with human life as the intent. Holmes Rolston, for example, in The Christian Century called it Shaken Atheism (1986), Sharon Begley in Newsweek described it as Science and the Sacred (1994), while Robert Wright asked in Time, What does science tell us about God? (1992). No doubt the universe would look quite different with the tiniest variation of the basic constants of physics. A slight difference in the strength of gravity, the charge of the electron, or the mass of the neutron, and life as we know it would not exist. The human race could not have evolved in a universe with different constants. Those who promote the notion of intelligent design think they have found confirmation in the way the universe seems to be exquisitely balanced on the tip of a needle for the purpose, they argue, of producing us. As yet no theory, including the currently highly successful Standard Model of elementary particles and forces, predicts the values of the fundamental constants of the universe. None is able to specify such basic facts about the universe as why the proton has the mass it does, or why the hydrogen atom has the size it does. In the Standard Model, the basic constants of the universe must still be put in by hand. No known first principle prevents any of these constants from taking no a random value from zero to infinity. Several physical constants have values that one would not expect from naive arguments of symmetry or ideas about the unity of phenomena. Recent development in particle physics suggest that all the fundamental forces of nature were unified as a single force in the extremely high energy of the early moments of the big bang. Today the forces are no longer identical and the huge differences between force strengths that we now measure are difficult to explain. For example the ration of strength of the electric and gravitational forces in an atom is 10 to the 39th power. That is, gravity and the electromagnetic force differ by 39 orders of magnitude. For later purposes, I will call this large value N sub 1. In the 19th century, the electric and genetic forces were found to be different aspects of the same basic electromagnetic force. This unification occurred despite the fact that the magnetic force on a charged particle is normally much smaller than the electric force. In the 1980s, electromagnetism and the weak nuclear force were found to be different aspects of the same basic electroweak force. This also came about in the face of the large difference between force strengths observed in the laboratory. In this and the previous examples, the differences in the observed strengths of unified forces are explained in a natural way. When and if gravity is unified with the other forces, its comparative weakness may be shown to be similarly natural. Or it maybe accidental. Starting with Hermann Weyl in 1919, many have speculated about the large size of the dimensionless number N and its possible connection with other large numbers in cosmology and microphysics. For example, the ratio of a typical stellar lifetime to the time for light to traverse the radius of a proton is another dimensionless number N sub 2 = 10 to the 39th power, which is the same order of magnitude as N1. This is the first of what are now called the anthropic coincidences. Most physicists greeted N sub 2 = N sub 1 "coincidence" with the same Bronx cheer, "Pbzzzpht, that they give to new interpretations of quantum mechanics. It seems like nothing more than numerology. Look around at enough numbers and you are bound to find some that appear connected (Gardner, 1991). In 1961, however, R. Dicke argued that N1 is necessarily large in order that the lifetime of main sequence stars be sufficient to generate heavy chemical elements such as carbon. Furthermore, N sub 1 must be of the same order of N sub 2 in any universe with heavy elements. If the gravitational attraction in stars were comparable in strength to the electric repulsion between protons, stars would collapse long before nuclear processes could build up the heavier chemical elements from the original hydrogen and deuterium (heavy hydrogen). The formation of chemical complexity is only possible in a universe of great age. Biological life needs time to evolve, a stable source of energy over that time, and raw material from which to build complex structures. That raw material includes carbon and other heavy elements to provide the diversity needed for the building of proficient organic systems. While hydrogen, helium, and lithium were readily synthesized in the first few minutes following the big bang, heavier nuclei could not appear until much later, after they were synthesized inside stars and released into space upon the explosive demise of these stars. The existence of elements heavier than lithium in our universe depends on what also appears to be some highly unlikely coincidences. Billions of years were needed for stars to form, to burn all their hydrogen fuel while manufacturing heavier elements, and finally to explode as supernovae, spraying their atoms into space. Once in space, these elements cooled and accumulated into planets. Billions of additional years were needed for at least one star to provide a stable output of energy so that one of its planets could develop life. In a debate on the existence of God held at the University of Hawaii on April 13, 1994, Christian theologian William Lane Craig was asked from the audience how he could believe that human beings have a special place in a universe that is so enormous and so old compared to humankind His answer was essentially that the universe had to be very big and very old to produce us. Paraphrasing Craigs answer, all the billions and billions of stars and galaxies that spread over billions of light years in billions of years were put there so that the chemistry needed for life and human beings had time to evolve (Craig, 1990, 1992). My responsse: Why not cockroaches? The element-synthesizing processes in stars depend sensitively on the properties and abundance of deuterium and helium produced in the early universe. Deuterium would not exist if the neutron-proton mass difference were just slightly different from its actual value. The relative abundance of hydrogen and helium also depends strongly on this parameter. The hydrogen-helium abundance also requires a delicate balance of the relative strengths of the gravitational and the weak nuclear interaction. A slightly stronger weak force and the universe would be 100 percent hydrogen, since all the neutrons in the early universe would then have decayed. A slightly weaker weak force and few neutrons would decay before being bound up with protons in helium nuclei where insufficient energy prevents their decay. All the protons would also be bound up, leading to a universe that was 100 percent helium. Neither of these extremes would have allowed for the existence of stars and life based on chemistry. The electron also enters into the tightrope act needed to produce the heavier elements. Because the electron mass is less than the neutron-proton mass difference, a free neutron can decay into a proton, electron and neutrino. If this were not the case, the neutron would be stable and most of the protons and electrons in the early universe would have combined to form neutrons, leaving little hydrogen to act as the component and fuel of stars. It is also rather convenient that the neutron is heavier than the proton, but not so much heavier that neutrons cannot be bound in nuclei. The evolution of life on earth thus depends critically on these relative force strengths and mass differences. With the slightest change of these values, the variety and diversity of the chemical elements would not exist. In their tome The Anthropic Cosmological Principle, John D. Barrow and Frank J. Tipler have gone to great lengths in seeking many similar connections--some quite remarkable, others a bit strained--between the physical parameters of our universe and the formation of complex, low energy material structures (1986). Carbon appears to be the chemical element best suited to act as the building block for the type of complex molecular systems that develop lifelike qualities. Even today, new materials assembled from carbon atoms exhibit remarkable, unexpected properties, from superconductivity to ferromagnetism. However, it is carbon chauvinism to assume that only carbon life is possible. We can imagine life based on silicon or other elements chemically similar to carbon, but these would still require cooking in stars. Hydrogen, helium, and lithium, which were synthesized in the big bang, are all chemically too simple to be assembled into diverse structures. Furthermore, it seems like molecular chauvinism to rule out other forms of matter in the universe as building blocks of complex systems. While atomic nuclei, for example, do not exhibit the diversity and complexity seen in the way atoms assemble into molecular structures, perhaps they might be able to do so in a universe with different properties. Sufficient complexity and long life are probably the only ingredients needed for a universe to produce life. Carbon may be unlikely, but as I will show, long life and complexity are not. The anthropic coincidences resonate with the mystical notions that human existence is deeply connected to the very nature of the universe. However, from the time of Copernicus, cosmology has been based on the principle that the universe is indifferent to humanity and human concerns. Most physicists are not quite ready to give up on the Copernican principle. They believe it should be possible to derive the values of the fundamental constants of nature from a yet-undiscovered Theory-of-Everything (TOE) that arises from a set of principles that operates at the level of subnuclear particles, not biological cells. It is very unlikely that a direct causal connection will ever be found between fundamental processes that apply at subnuclear scales and the details of complex structure on the macroscopic scale of everyday life. I doubt if any TOE will tell us why we have five toes on each foot, or why the three-toed sloth has three. Most of the properties of the macroscopic world were not predetermined by events in the early big bang, but emerged by the processes of chance and natural selection. As pointed out by Stephen Gould (1989), rewinding the tape of evolution and playing back again would have infinitesimal probability of once again producing Homo sapiens. I can conceive the possibility that some or all of the constants of physics also took on the values they did by chance and, like evolution, were not designed by either a Creator or physical law. The chance that any initially random set of constants would correspond to the set of values they now hold in our universe is very small. Cosmologist Roger Penrose (1989) has calculated that the probability of our universe is one part in (1O10)123. In The Emperors New Mind, Penrose has a cartoon of the Creator pointing a finger toward an absurdly tiny volume in the phase space of possible universes to produce the universe in which we live. This has given comfort to believers. In the Hawaii debate mentioned above, theologian Craig argued that this unimaginable low probability illustrates the need for a Creator, because the universe could not have happened by chance. Most of the audience greeted that with enthusiastic nods. Only a few of us sat there with puzzled looks on our faces. But claiming our that universe is a miracle because of its unlikelihood, calculated after the fact, is like the TV ads for publisher sweepstakes that sing Miracles can happen, can happen to you if you simply send in your entry. It may seem like a miracle to the person who wins ten million dollars, but it was a certainty that someone would win. It is like calling the sunrise each morning a miracle. Every human being on earth is the product of a highly elaborate combination of genes that would be a very unlikely outcome of a random toss. Think of what an unlikely hem you are, the product of so many chance encounters between your male and female ancestors. What if your great-great- great grandmother had not survived that childhood illness. What if your grandfather had been killed by a stray bullet in the war, before he met your grandmother? Despite all those other possibilities, you still exist. If you ask, after the fact, what is the probability for your particular set of genes existing, the answer is 100 percent! Certainty! Similarly, the probability for the universe we live in existing as it does, having the values of the fundamental constants that it has, is not one in 10 to the 10th to the 123rd. It is 100 percent! Some universe happened, and it happened to be the one we have. Still, it is argued that if a universe were created with random values of the physical constants, a universe with no life would have almost certainly been the result. Of course, no one would then be around to talk about it and the fact is we are here and talking about it. Unfortunately, we have no way of talking about it with strict rationality. We do not have enough information in the. form of examples of other universes to use as data to draw reasonable conclusions. Several commentators have argued that a many-universes cosmology violates Occams razor. I beg to differ. The entities that the law of parsimony forbids us from multiplying beyond necessity are theoretical hypotheses, not universes. Though the atomic theory multiplied the number of bodies we consider in solving a thermodynamic problem by 10 to the 24th or so per gram, it did not violate Occams razor. Rather it provided a simpler, more powerful exposition of the rules that were obeyed by thermodynamic systems. Similarly, if the many-universes cosmology provides an explanation for the origin of our universe that does not require the highly nonparsimonious introduction of a super- natural element that has heretofore not been required to explain any observations, then that explanation is more economical. An infinity of random universes is suggested by the modern inflationary model of the early universe. A quantum fluctuation can produce a tiny, empty region of curved space that will expand exponentially, increasing its energy sufficiently in the process to produce energy equivalent to all the mass of. the universe in a mere 10 to the minus 42nd. Cosmologist Andre Linde has proposed that a spacetime foam empty of matter and radiation will experience local quantum fluctuations in. curvature, forming bubbles of false vacuum that individually inflate, as described above, into mini-universes with random characteristics (Linde, 1982, 1987; Atkatz, 1994). In this. view, our universe is one of those expanding bubbles, the product of a single monkey banging away at the keys of a single word processor. I thought it might be fun (and instructive) to see what some of these universes might look like. Of course, other universes may have different physical laws and we have no idea what those laws might be, although we ca always speculate. All we really know is our universe an its laws. Even in this case, different values of the constants that go into our familiar equations will lead to universes that do not look a bit like ours. From the values of just four fundamental constants, the physical properties of matter from the dimensions o atoms to the length of the day and year to the age of main sequence stars can be estimated. Two of these constants are the strengths of the electromagnetic and strong nuclear interactions. The other two are the masses of the electron and proton. This is not, of course, the whole story. Many more constants are needed to fill in the details of our universe. The gross properties of our universe are determined by these four constants, and we can vary them to see what a universe might grossly look like with different values of these constants. I have written a program--Monkey God--posted on the Skeptic Web site--which the reader is welcome to use. Try your own hand at generating universes. Just choose different values of the four constants and see what happens. While these are really only "toy" universes, the exercise illustrates that there could be many ways to produce a universe old enough to have some form of life. The lifetime and mass of a typical main sequence star sets the scale for the age of a universe populated, in the vicinity of at least one such star, by complex material systems assembled from chemical elements produced in the stars themselves. Thus we can easily determine what a universe will look like if it possesses values of the basic parameters that differ from our own. electromagnetic force is given by alpha (for greater familiarity, 1/alpha is printed out). The strength of the strong nuclear force is alpha s. Both of these quantities are dimensionless (that is, they have no units). The electron mass is indicated by Me, the proton mass by Mp. Both are in kilograms. In the tables tight, I have rounded off most of the results since only orders of magnitude are really significant in a calculation of this type. The abbreviation for the units in the answers are standard in any physics text. Figure 1 shows a scatter plot of N sub 2 vs. N sub 1 for 100 universe in which the values of the four parameters were generated randomly from a range five orders of magnitude between their values in our universe, that is, over a total range of 10 orders of magnitude. We see that over this range of parameter variation, N sub 1 is at least 10 to the 33rd and N sub 2 at least 10 to the 20th in all cases. That is both are still very large number. Although many pairs do not lie exactly on the diagonal N sub 1 = N sub 2, the coincidence between these two quantities is not supernaturally rare. The distribution of stellar lifetimes for these same 100 universes is shown in Figure 2. -While a few are low, most are clearly high enough to allow time for stellar evolution and heavy element nucleosynthesis. I think it is safe to conclude that the conditions for the appearance of a universe with life are not supernaturally so improbable as those authors enamored by the anthropic principle would have you think. Atkatz, D. 1994. Quantum Cosmology for Pedestrians. Am. J.
Barrow, J. D. and F. J. Tipler. 1986. The Anthropic Cos- mological Principle. Oxford: Oxford University Press. Begley, S. 1994. Science and the Sacred. Newsweek. Novem- ber 28, p. 56. Carter, B. 1974. Large Number Coincidences and the Anthropic Principle in Cosmology, in Confrontation of Cosmological Theory with Astronomical Data, M. S. Longair (ed. ), Dordrecht: Reidel. Craig, W. L. 1990. What Place, Then, For a Creator? : Hawking on God and Creation. Brjt. I. Phil. Sci. 41,473-491. 1992. 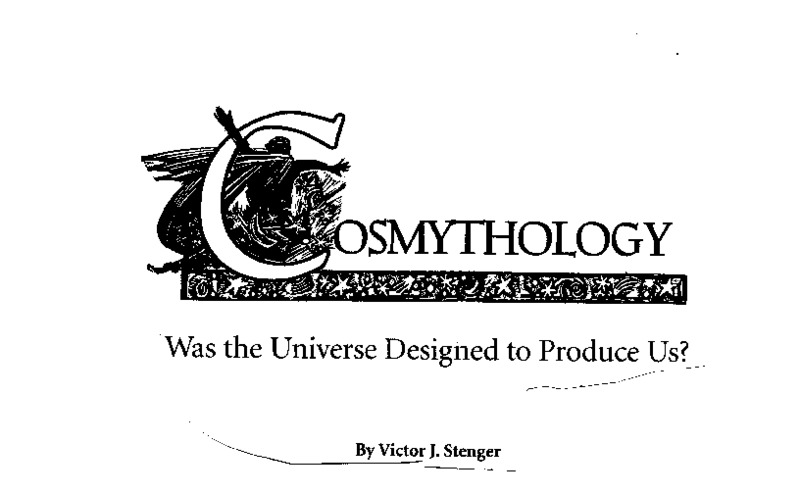 The Origin and Creation of the Universe: A Reply to Adolf Grunbaum Brit. J. Phil. Sci. 43, pp. 233-240. Davies, P. C. W. 1982. The Accidental Universe. Cambridge: Cambridge University Press. Dicke, R. H. 1961. Diracs Cosmology and Machs Principle. Nature. 192, 440. Everett, H. III. 1957. Rev. Mod. Phys. 29, 454. Gardner, M. 1991. Tiplers Omega Point Theory. Skeptical Inquirer. Vol. 15, No. 2:128-134. Nature of History. New York: Norton. Gribbin, J. and M. Rees. 1989. Cosmic Coincidences: Dark Matter, Mankind, and Anthropic Cosmology. New York: Bantam Books. Linde, A. 1982. Physics Letters. 108B, 389. ___ 1987. Particle Physics and Inflationary Cosmology. ___ 1994. The Self-Reproducing Inflationary Universe. Scientific American. November. ers, Minds, and the Laws of Physics. Oxford: Oxford University Press. Press, W. H., and A.P. Lightman. 1983. Phil. Trans. R. Soc. Lond. A 310, 323. Weyl, H. 1919. Ann. Physik. 59, 101. LOST AND SO TOO WAS THE 1.5 SPACES BETWEEN LINES. I HAD TO SEND THE FIGURES BELOW NOT AS TEXT BUT AS GRAPHICS, FOR OF THE ABOVE REASON, AND BECAUSE LYCOS DESTROYED THE COLUMNS. MOREOVER THE COLUMN FORMATING OF THE ARTICLE HAS BEEN BUTCHERED AND ITS ITALICS ALSO HAVE BEEN LOST. STENGER HAS EXPANDED THIS ARTICLE INTO A BOOK, RECENTLY PUBLISHED.